Ordinances. Number 2 in the Seven Kitchens Press ReBound Series, selected by Ron Mohring. Originally published in 1989 by Ardis Press. This new second edition includes an introduction by Edward Field. 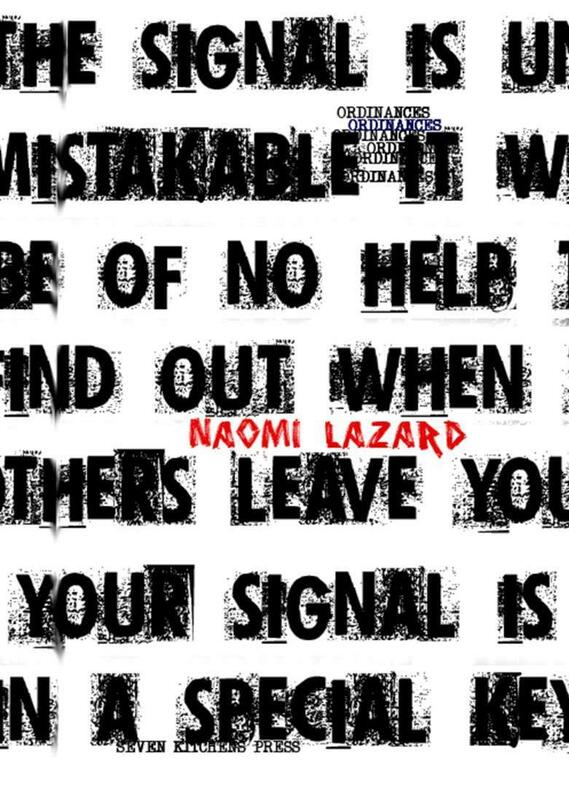 Naomi Lazard‘s work has won many awards, including two Fellowships from the National Endowment for the Arts (one for poetry, and one for her translations of Faiz Ahmed Faiz). She is the author of Cry of the Peacocks, The Moonlit Upper Deckerina, What Amanda Saw (a children’s book), The White Raven (a screenplay), and The Elephant and the Dove (a stage play). Her writing has appeared in many journals, including The New Yorker, Chicago Review, Harper’s, The Paris Review, and The American Scholar, and has been reviewed in The New York Times, Grand Street, The Village Voice, and The San Francisco Chronicle, among many others. In 1992, Lazard co-founded The Hamptons International Film Festival. nor is there any chance for a settlement. Nobody knows how it will end. is contained in a small area, the front. Please click here to purchase Naomi’s chapbook.